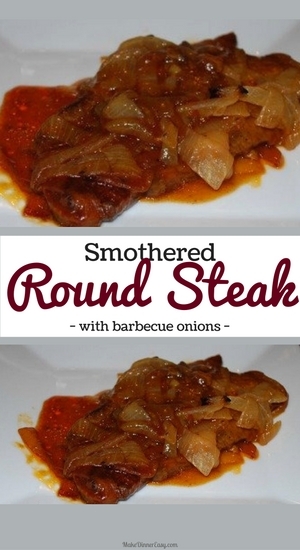 This smothered round steak is an oven baked steak recipe that is inexpensive to make but fork tender to eat. I came up with this recipe after seeing a package of thinly sliced round steaks at the store for $2.98 a pound. I bought five steaks for only $3 and the result was a delicious and very tender steak. 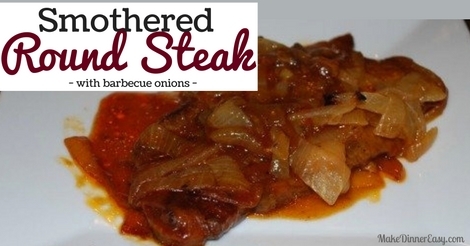 Round steak becomes more tender with a long cooking time. So, if you are home a few hours before dinner, you can make a delicious steak dinner on a budget. Place flour, salt, black pepper and paprika in a large zip style bag and shake to combine these ingredients. Add steak to the bag, close the bag, and shake to coat the steak with the flour mixture. Heat the oil on medium low in a large non-stick skillet. Place the steak in a single layer in the skillet, sprinkling any excess flour in the bag on top of the steaks. Brown the steaks for 2-3 minutes per side. Meanwhile, line a 9" x 13" x 2" baking pan with about 2 feet of heavy duty aluminum foil. Place the browned steaks in the foil lined pan. Return the pan to the burner and add the sliced onions. Saute the onions over medium low heat for about 3-5 minutes, stirring often so that they don't get overly browned. Add the broth and barbeque sauce to the onions, continue to cook for 3-4 minutes, stirring frequently until combined well. Pour this broth mixture over the steaks in the foil lined pan. Bring all of the edges of the foil tightly together but still leave a little air space between the steak and the inside lining of the foil. Bake at 350'F for 2 hours. 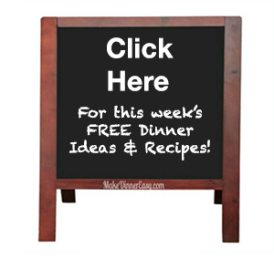 Click on the Pin It Button Below to Pin it For Later!